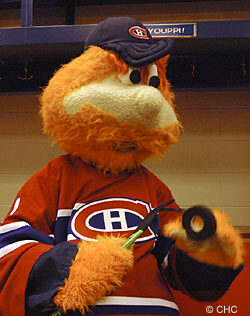 Standing by his own stall in the Canadiens dressing room, Youppi! prepares his stick for Sunday's preseason contest against the Atlanta Thrashers. 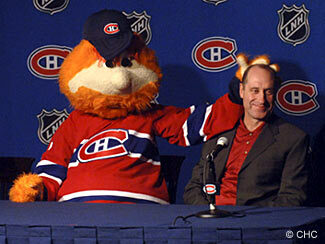 MONTREAL - Canadiens President Pierre Boivin announced Friday the official lifetime adoption of Youppi! as the organization's new mascot. Youppi!, age unknown, will make history in becoming the first mascot in professional sports history to move from one league to another when he makes his in-game debut with the Canadiens in October 2005. The beloved orange-furred creature, a staple at Olympic Stadium from 1979 through 2004 while with Major League Baseball's Montreal Expos, found himself without a home when the latter franchise moved to Washington, D.C., ahead of the 2005 season. "It is with great pleasure that we can now count Youppi! as an official member of our organization," said Boivin. "Youppi! has touched the lives of countless fans of all ages with both his in-game enthusiasm and with his generosity throughout the Montreal community. As undoubtedly one of the most recognizable mascots in Major League Baseball over the past 26 years, we look forward to introducing Youppi! to the game of hockey and to the NHL as a whole, and to keeping him active and visible in the city where he belongs. Youppi! will also be a very valuable asset for the Montreal Canadiens Children's Foundation. There could not be, in fact, a more natural association." "When it became apparent we had the opportunity to preserve a small element of the Montreal Expos legacy by retaining the services of Youppi!, there was no hesitation on our part to do so," said Canadiens Vice-President of Marketing and Sales, Ray Lalonde. "Youppi!, who will become the first official mascot in Canadiens history, will now get the opportunity to be introduced to future generations of sports fans." Joining Gainey and Lalonde for the official signing of Youppi! 's "adoption certificate" were Canadiens GM Bob Gainey, former Expos Vice-President of Business Affairs, Claude Delorme, and the mascot's original "godfather" who helped bring him into existence while working for the Expos in the late '70s, Roger D. Landry. Landry was thrilled at the prospect of Youppi! finding a new home. "I think this is a perfect fit for Youppi!," he said. "I couldn't have imagined a better adoptive family than the Montreal Canadiens. I remember the night when we came up with his name like it was yesterday - I told [former Expos employee and current Montreal sports broadcaster] Rodger Brulotte that I wanted a character that would make the kids say 'youppi!' when they saw him. Rodger said, 'That's it, you just found his name', and the rest is history." Youppi!, who took part in excess of 4000 public outings during his 26-year tenure with the Expos, will make his first public appearance in a Canadiens uniform at the team's Jamboree on Sunday, Sept. 18. Activities at the annual fan-fest will begin with a Canadiens open practice at the Bell Centre at 9:00 a.m. Also featured during the day are street hockey games featuring Canadiens players and Alumni, photo and autograph sessions, and giveaway prizes, including tickets for the Canadiens' preseason opener the same night against the Atlanta Thrashers.